In our agrarian past, we didn’t have a grocery store in every town receiving shipments of fresh fruits and vegetables from all corners of the world on a daily basis. Food preservation was a necessity to survive the long winter in most locations. 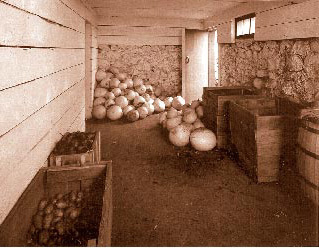 Over the centuries, many have gotten their winter produce fix from a simple non-tech solution: the root cellar. Last year when I did my One-Month Stockpile Challenge, I realized that this was a glaring omission in my food stockpile process, so this year, I’m determined to add this strategy to take my stockpile to the next level. Fall is the perfect time to begin because for the next few months, those hard-shelled root vegetables as well as items like apples and potatoes, will be abundant and cheap. The first root cellars in recorded history were in Australia – 40,000 years ago it is indicated that they were burying their yam harvests in order to keep them fresh. Since then, underground food storage caches have been found all over the world, as people took advantage of the cool moist atmosphere a few feet down. The produce is still alive – stored carbohydrates of energy is consumed in the presence of oxygen and produces heat and carbon dioxide. To maintain the proper “living” conditions, at least three variables need to be considered: temperature, humidity and ventilation. Most cold tolerant or cool season crops will store best between 33 and 35F or just above freezing and up to 40F. Warm season crops sensitive to chilling injury (tomatoes, cucumbers, etc) are typically stored at temperatures above 50F unless processing, cooking or eating will occur shortly after removal from storage. The temperature needs to be actively monitored and managed and will vary with the quantity of produce in the space. Most root and leafy crops will store best at high humidity (+80%) or moisture levels. Root crops like carrots need to be stored in some moist medium to maintain quality. Some crops like onion, garlic and winter squash store better at low humidity level (less than 60%). Moisture may need to be added by wetting the floor or walls with water depending on the construction methods. Reasons for ventilation include: 1) removal of heat of respiration, 2) replenishing the oxygen supply, 3) removing volatile compounds from the produce that may effect flavor or sprouting like ethylene. The greater the density or amount of produce in the space, the more ventilation is needed. Ventilation or air tubes need to be planned prior to construction and place during construction. You can’t just place everything together and hope for your food to all remain fresh. Some items cannot be stored together because they release a gas called ethylene. Ethylene gas is a ripening agent,which hastens the decomposition of other produce. For example, apples, pears, and tomatoes produce high amounts of ethylene and should be placed higher than other foods, and near vents if possible. They should not be placed near potatoes and carrots, as the ethylene will cause those to spoil rapidly. Some produce will easily absorb odors from items with strong smells. Strong smelling foods like cabbages or turnips can be wrapped in newspaper to help contain the smell. Onions store well when hung in mesh bags. Two small investments for your root cellar should be a thermometer to measure temperature and a hygrometer to measure humidity. This way you can ensure your conditions are right to keep your food fresh for the longest possible time.